Farewell, Starman. We hardly knew you. 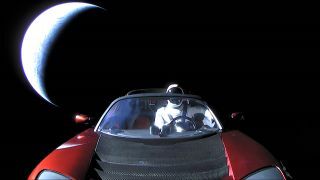 The photo, which Musk shared Wednesday on Instagram, shows Starman in the Roadster with the entire Earth in background. "Last pic of Starman in Roadster on its journey to Mars orbit and then the Asteroid Belt," Musk wrote on Twitter. Starman and Musk's Roadster are in an elliptical orbit around the sun. At their closest point to the sun, they will fly just inside the Earth's orbit. At their farthest away, they'll be 243 million miles (390 million kilometers) from the sun. For comparison, Earth's average distance from the sun is about 93 million miles (150 million km). Mars orbits the sun at 142 million miles (228 million km). After reaching orbit, the Roadster coasted through space for about 6 hours before the Falcon Heavy second stage fired up one last time to send the car out into deep space. Musk said Tuesday that the batteries for the cameras were only expected to last 12 hours, so this is likely the last we'll see of the Roadster and Starman. So, until we meet again: Godspeed, Starman. Keep on cruising.